Every winter the Monarch butterflies head south for overwintering. This past winter the butterfly population of the western Monarch seems to have decreased drastically, some figure it at high at 86% from the prior year. The numbers have been steadily declining since the 80’s. These are the Monarch’s that overwinter in coastal California. The good news is that the Eastern Monarch, which overwinters in Mexico shows an increase of 144% over the prior year. Each of use with a yard, an acreage, or even a window box can help with the population of Monarchs (and other butterflies) by providing much needed habitat for these graceful beauts. How to help? If you live where you can…. leave some areas wild and unmown. Refrain from the use of pollinator killing pesticides, herbicides that kill milkweed. Start your flower gardens early. Butterflies returning from the south in the spring need nectar. Plant early blooming varieties as well as later season varieties so that something is always blooming in your garden. Butterflies prefer a flat flower to feed on but will feed on anything that’s in bloom. 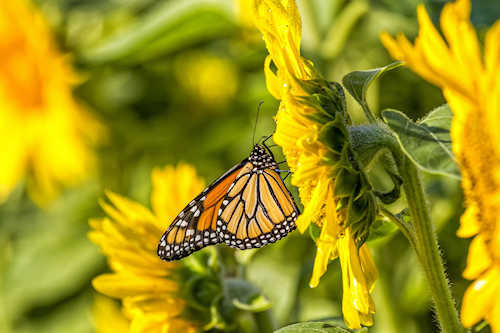 When you have a wide variety of different native flowering plants for nectar, you’ll attract the Monarchs as well as other butterflies and pollinators to your garden. While you’re at the garden nursery be sure to pick up some milkweed for your garden. As you are certainly aware by now, Monarch butterflies, in their caterpillar stage, only eat milkweed.